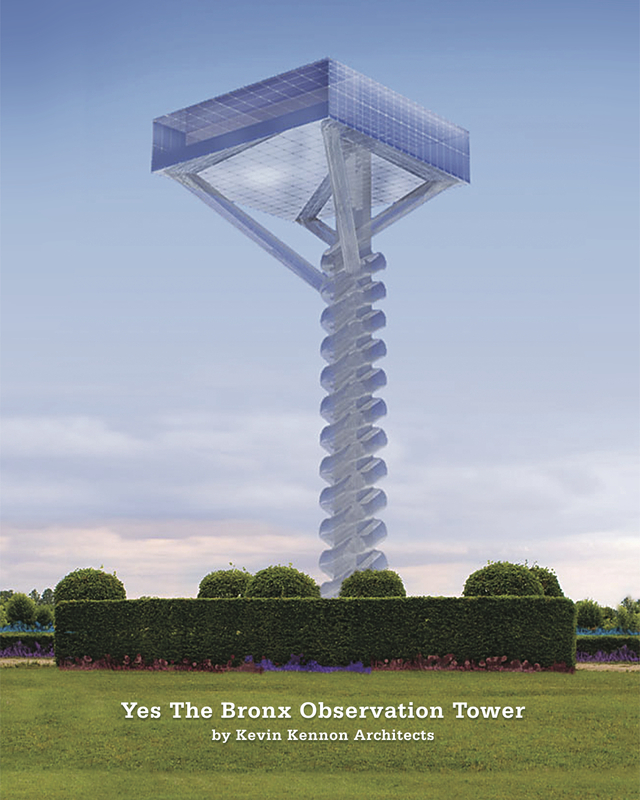 The ‘Yes the Bronx’ Observation Tower consists of a raised platform, which stands 176 feet tall, a central access elevator, and two spiraling structural stairways which branch to support the 85 foot square metal and glass enclosure. The tower will be constructed of only recycled materials from the Bronx and is designed according to LEED Standard Gold Equivalent. The proposal is in concert with an ongoing public campaign that began in the Bronx in 2006. The Yes the Bronx movement seeks to encourage positive dialogue, and embrace a renewed, dynamic vision for the borough through fostering the diversity and progress the Bronx possesses. Visitors to the proposal are invited to ascend the structure, and look out upon the landscapes of the Bronx and Manhattan. Access to the viewing platform above can be gained through two routes. By choosing either of the ceremonial, winding staircases, one ascends slowly, with purpose and determination not only to gain access to the platform, but to observe the changing landscapes of the surrounding areas in slow motion. The direct route up via elevator allows for a speedy change of visual perspective, from participant in the ground landscape to overseer of the land below. The proposal is sited in a high-visibility location on the Bronx waterfront, thus encouraging public exposure and curiosity about the meaning of the structure and the campaign Yes the Bronx itself. The viewing platform becomes a unifying, and inhabitable rallying point whose impact will hopefully encourage a replacement of outdated negative stereotypes for the area. The public is welcomed gracefully to the site to further explore the surroundings and engage with the people and culture that both inhabit and visit the borough so frequently. Hostos Community College has committed to run a recycling education center at the base of the tower for New York City school children and tourists. The enclosed space above is envisioned to host cultural and community events, while providing an opportunity to incite enthusiasm about the future of the Bronx among residents, as well as visitors. The dynamic form and graceful gesture of the public platform resonate with the strength and bold vision that the Yes campaign is evoking throughout the Bronx and New York City. Yes will support a foundation (“friends of Yes the Bronx”) for ongoing maintenance of the observation tower. Event monies would subsidize operating costs. School tours will take advantage of recycling and ecology education center. This iconic structure will serve as a permanent symbol of Bronx pride and achievement. It will help erase the outdated perceptions of the Bronx while providing a central focus to help unify the diverse groups that make up the Bronx today. This multi-function building will also work to educate residents on ecology and recycling while generating income and notoriety as a first-rate event location. Kevin Kennon Architects, founded in 2002, has grown to a full service firm dedicated to improving the built environment through design excellence, innovation and public service. We create architecture today that responds to the way in which people will work, live and play tomorrow. We bring an award-winning global perspective to help our clients achieve world-class architecture. We use advanced digital technology to create stunning buildings and spaces more cheaply and efficiently than our competition. We are dedicated to extensively researching each project to ensure our standard of delivering unique architecture tailored to the aspirations of our clients. We have extensive national and international experience including high-rise office towers, corporate headquarters, large-scale residential development, retail centers, community centers, museums, libraries, master plans, schools and apartments. With global partners in Asia and in the U.A.E. we design unique projects for unique clients.